Catch us LIVE on Fins and Fluke Radio 9/18! Our lovely friends at Fins and Fluke have invited us to be a part of their environmental radio program, Fins and Fluke Radio. 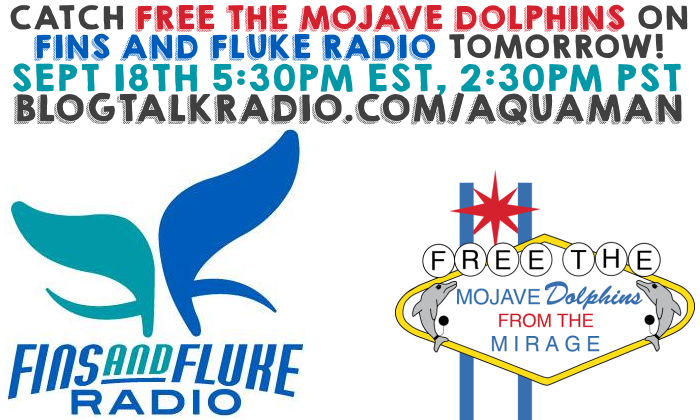 We will be representing the Mojave Dolphins live on the air tomorrow, September 18th, at 5:30pm eastern, 2:30pm pacific. The radio program takes place online, so no matter where you are, you are able to listen in. Help us spread the global message that dolphins do not belong in the middle of the Mojave desert!